Women have always been an important part of American agriculture. Today, they are stepping up to exciting new challenges and influential roles. Women in Iowa are managing complex farms and agribusinesses, innovating food production and land conservation, and teaching or becoming the next generation of agriculturalists. Just 15 years ago, women were 42 percent of the undergraduates in the College of Agriculture and Life Sciences at Iowa State University. Today that number has jumped to 51 percent. More than one-fourth of all Iowa farmers are women and they generated an economic impact of $474 million according to the USDA-NASS 2012 Census of Agriculture. Looking at women in agribusiness, the 2015 study, Gender Roles & Equality in Agribusiness, stated nearly 90 percent of women feel optimistic about their opportunity for advancement in agricultural careers. 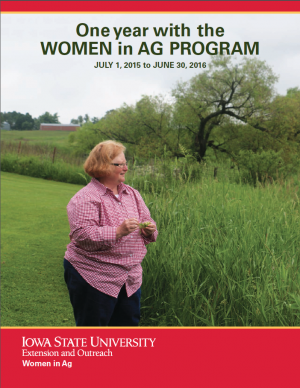 In an effort to be more responsive to these women, Iowa State University Extension and Outreach established the Women in Ag program on July 1, 2015. This program builds on the strong foundation of Annie’s Project in our state. We enjoy teaching about business planning, so the first thing we did was create a multi-year business and education plan for the new program. We borrowed from the balanced scorecard, a framework for achieving strategy and vision, to develop goals around four perspectives. During a transitional year, another goal we had was to continue to grow Annie’s Project nationally by assisting other educators. The first year of the Women in Ag program was incredibly satisfying as we worked towards these goals. We had fun educating women by combining research-based information with local courses, tours, online courses and countynetworks. We were really social by connecting online and in person to share stories, make new friends and encourage women to be life-long learners. We built the capacity of our educators by bringing the best minds together and working across boundaries. We were good financial stewards by nurturing meaningful partnerships and leveraging financial resources. We led professional development programs for Annie’s Project educators from across the nation. Along the way, we met many women who truly humbled and inspired us. We highlight a few of their amazing stories in this annual report. Our educational programs improve lives by extending knowledge and empowering women. It is rewarding to see these women create public value by making a positive difference on Iowa’s agricultural sustainability and global food security as the world population climbs to 9 billion by 2050. Please download and read our report!